Chris Bellows is just trying to get through high school and survive being the only stepchild in the social-climbing Fontaine family, whose recently diminished fortune hasn't dimmed their desire to mingle with Upper East Side society. Chris sometimes feels more like a maid than part of the family. But when Chris's stepsister Kimberly begins dating golden boy J.
J. Kennerly, heir to a political dynasty, everything changes. Because Chris and J. J. fall in love . . . with each other. With the help of a new friend, Coco Chanel Jones, Chris learns to be comfortable in his own skin, let himself fall in love and be loved, and discovers that maybe he was wrong about his step-family all along. All it takes is one fairy godmother dressed as Diana Ross to change the course of his life. 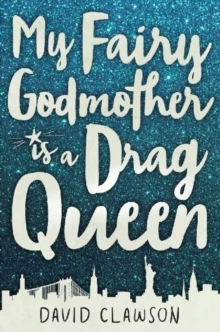 My Fairy Godmother is a Drag Queen is a Cinderella retelling for the modern reader. The novel expertly balances issues like sexuality, family and financial troubles, and self-discovery with more lighthearted moments like how one rogue shoe can launch a secret, whirlwind romance and a chance meeting with a drag queen can spark magic and light in a once dark reality.